Last week, Issa and I discussed his earlier game show appearances – on The Rich List, Who Wants To Be A Millionaire and Millionaire Hot Seat. SH: Apart from those TV appearances, you’ve also long been a fixture on the Australian Quizzing scene. In fact, you’re a six-time winner of the Australian Quizzing Championships (2011, 2013, 2014, 2016, 2017, 2018) and six-time Pairs Champion (2012-17). Can you tell me a bit about that area of your life? Just how all-consuming has it been? IS: It is probably my favourite part of quizzing nowadays. I discovered Quizzing Australia (the organisation that runs these events) back in 2008, and I decided to fly myself to Sydney to compete. I came second that year but was instantly hooked. It really is “next level” quizzing. It is run concurrently with the World Quizzing Championships and consists of a whopping 240 questions over eight categories, done in two hours with a break in between. As the questions are the same worldwide, you get a massive range, and the difficulty is very high. Last year I was fortunate to win Aussie title No. 6 and reached 57th in the world – absolutely delighted. For the first time, I finished ahead of Anne (The Governess) and she wasn’t necessarily thrilled! SH: Do you still have time to compete in this arena, now that you’re working on The Chase Australia? If so, has becoming a Chaser helped your game there? IS: Oh, absolutely. If anything, I am probably guilty of studying for international competitions more than The Chase. There is a little bit of a crossover, but naturally many questions in a world championship aren’t going to be suitable for a televised Australian quiz show – too obscure and many are too long, for example. But doing The Chase has definitely helped my general knowledge across the board. I remember one year at the World Quizzing Championships, Brydon and I had a little chuckle because a question asked had just come up at a recording the week before. Every month, there are two international quizzes of 100 questions each called ‘Hot 100’ and ‘Squizzed’, both of which are excellent and I always put time aside to compete in both. We have groups meet up twice a month to do these in Brisbane, Melbourne, Sydney and Perth. It’s great just to socialise and be guaranteed a decent, interesting quiz. Personally, I think this is sad, and I’m trying to teach my daughter to value and cultivate and exercise her general knowledge. It’s part of being a well-rounded, interesting human being, after all. What are your thoughts on this? 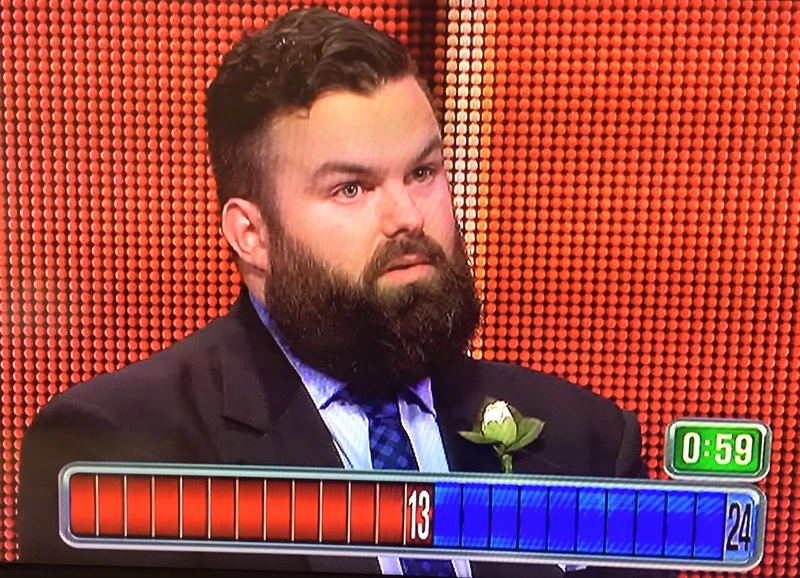 This week, I’m absolutely DELIGHTED to bring you my latest exclusive interview with one of The Chasers, from the hit show The Chase Australia. Following on from my previous interviews with ‘Goliath’ (AKA Matt Parkinson), and ‘Tiger Mum’ (AKA Cheryl Toh)… Today, I’m delighted be talking to another firm fan favourite… ‘The Supernerd’ (AKA Issa Schultz)! Issa was very generous with his time in this very wide ranging conversation, and I hope you enjoy our chat as much as I did. SH: Issa, thanks very much for chatting to me today for HowToWinGameShows.com! IS: An absolute pleasure Stephen, long-time fan! Delighted to have a chat. SH: You grew up in England, moving to Australia in 1995 when you were 11 years old. Had you already been bitten by the quiz bug back in England? What quiz shows or game shows did you watch over there, as a child? IS: Back in the UK, my father ran an establishment that I think he called “The Liberal Club” and he would host trivia nights every week. I would arrive at the club right near the end of these nights (after Cub Scouts! ), and would occasionally overhear some of the questions – and it made me sit up and listen. I remember thinking “hey, I like this question / answer concept!” The big quiz shows of the day back then were Fifteen to One (hosted by the late great William G Stewart) and Mastermind (similarly the late great Magnus Magnusson). SH: When and where did your interest in competitive quizzing begin? IS: My family and I went to pub quizzes regularly up on the Sunshine Coast as I went through high school, but I think it got more serious once I moved to Brisbane in 2002, as I realised the pub quiz scene down here was more difficult and harder to win. I’d find myself buying quiz books and reading those instead of my uni books (!!). Likewise, back in high school I remember handing one or two assignments in late because I had chosen to go to a pub quiz the night before they were due! SH: When you were 21 years old, you appeared on The Einstein Factor – I looked this up on imdb, and it appears your special subject was either ‘The Academy Awards’, ‘Australian Birds’, or ‘The Life and Times of Carl Lewis’… so, which one was it, and how did you do on the show? IS: Aha, well researched sir! Yes that was back in 2005, and I had opted for Academy Awards. In hindsight my preparation was terrible, I think I had just looked at a couple of lists and some “weird Oscar factoids” and assumed/hoped that would do the trick. Back then of course, Wikipedia was very much in its infancy, so potential resources were all over the shop. I came second overall, the chap who did Australian Birds really knew his stuff. Funnily enough, the chap who came third in that episode I had previously met, on a recording of Millionaire. He said “Oh no, not you again!”. SH: What did you learn from that experience? IS: The wonderful thing about The Einstein Factor was that you were really playing for “the honour” rather than any cash prize. Sure I was disappointed, but equally as a struggling 21 year old it was so nice to have paid flights and accommodation at St Kilda. Little highlights like spotting Tim Ferguson (one of the show’s “Brains Trust”) afterwards in the local 7-11 stay in my mind. From a quizzing angle, I realised that going forward, I’d really need to do more preparation. That was my second TV quiz show and second loss at that stage. I also realised, watching it back, that I should jolly well get a decent haircut next time I’m on TV! And that’s where we leave it for this week. When our interview continues next week, Issa and I discuss his biggest quiz show win, how he spent the money, and he reveals his insider tips for Who Wants To Be A Millionaire…. And, for those playing along at home, the next time he went on TV he DID have a decent haircut. Yes, alright – fair enough Cheryl. SH: What do your family think of the persona you’ve adopted for the show? How much of a Tiger Mum are you in real life? CT: My family likes the nickname. It was either me or my father who first suggested it. Many women, especially in the Asian community, regard it as a compliment to be called a “tiger mum”. For me, I am having a bit of a laugh at myself. While tiger parents have many great qualities, it wouldn’t hurt them to have a bit of a laugh at themselves occasionally too, I reckon. My kids will have to answer your second question! My sister-in-law Yvonne leaves me in the dust though – she makes her son do 5 hours of homework every day. SH: What sort of study or training do you do for the show each week? CT: I read eclectically, go to a couple of pub quizzes, watch quiz shows and play on a few quiz apps. I have a very smart English friend in Harrogate (a surgeon) called Jon who sends me lots of challenges. He loves the British version of The Chase and hopes he can see one of my episodes someday. Sometimes I’ll trade questions that I think are challenging or interesting with my mates (including Issa) on email or WhatsApp. My good pal Alan talks a fair bit about sports, current affairs and movies and I pick up plenty of tidbits from him. SH: And finally… (I understand entirely if you’d prefer not to answer this, but I feel I’d be neglecting my duty if I didn’t ask)… are there any tips you can share for any aspiring contestants wanting to go up against you on The Chase? CT: Do your homework! That’s good general advice not just Tiger Mum advice. Like most things in life, you will do better on quiz shows if you have prepared yourself mentally. Watch lots of episodes of The Chase Australia, and read Stephen Hall’s marvellous book which covers many practical aspects of quiz shows. Going on a quiz show is not an experience that many people have, and reading this book gives you insights from people who have actually done it, and won! I do hope to meet many more contestants, as I’ve faced such lovely and interesting people so far. Andrew (O’Keefe) and the crew do an awesome job of making the day a fun and memorable experience for contestants. I think 99% of them go away having had an absolute blast, plus they get the chance to enjoy watching themselves on national TV later with family and friends. I certainly appreciate their courage, good humour and sportsmanship. Which I most highly recommend you do. Hello, and welcome to my first EXCLUSIVE interview for 2019. Today, I’m really pleased to bring you my chat with the newest addition to the cast of The Chase Australia… Cheryl Toh, otherwise known as The Tiger Mum! As you’ll see, I was aware of Cheryl’s presence in the quiz community, and so was really pleased to see her pop up as the newest Chaser in the Australian version of the hit quiz show. I’m very grateful to Cheryl for taking the time to chat with me… now let’s see what she had to say! SH: You have quite a background in trivia and quizzing – was it through Martin Flood that you and I met? CT: I haven’t actually had the pleasure of meeting you in person, but yes, we first got in contact via Marty Flood. I was already a big fan of yours having watched you blitz it on Temptation. I also really enjoyed your work on The Hollowmen. You’re a VERY funny guy! SH: Thank you, you’re very kind! Have you always been interested in trivia, and quizzing? Where did your interest come from? CT: I started quizzing properly in my mid 20s. It came about by chance. I was living in Melbourne at the time and decided to go along to a Temptation audition, for some fun. To my surprise, I answered most of the test questions correctly and was contacted quite quickly to appear as a contestant. I was only on one episode but won over $8000 from a lucky Vault spin and some prizes from the Famous Faces board. The experience taught me to back myself on answers more confidently, as I hesitated in the final 60-second round and it cost me the game. I also discovered quiz shows are really fun! Although I didn’t quiz much before that, I really liked studying throughout my school years, so the interest in learning was there from quite a young age. I credit my excellent primary school teachers for enthusing me about knowledge, as well as my parents who emphasised the importance of doing well in my studies. SH: And if memory serves, you appeared on The Einstein Factor – what was your special subject? CT: You are right, I was on The Einstein Factor and my special subject was the TV series Poirot. I lost to Andrew McDonald, who went on to become the Series 4 champion. CT: That Andrew knows a LOT about the Luftwaffe and heaps of other stuff! I picked up that buzzer technique (timing) is very important, and that in most quiz shows, you must stay very focussed as the outcome can change in a matter of seconds. SH: Back in 2015, you were a contestant on Million Dollar Minute – how did you go there? CT: I won $75,000 on Million Dollar Minute. SH: And what did you learn from that experience? CT: It was really important on that show to get into a good rhythm with the buzzing. I also found from my own experience, and from watching others who’d gone on this show before me, that staying calm helps one’s performance. I learned that I didn’t have the most resilient attitude towards failure, and I have tried to change for the better since then. SH: Before The Chase came along, you had been a lawyer in your professional life. Did that help prepare you in any way for your role in the show? If so, how? CT: Oh I’m still a lawyer Stephen! I still have a regular day job like most people. 🙂 I don’t know if training in any particular field gives you an advantage in quizzing. It’s true though that lawyers are used to reading a lot. And I think reading widely is one of the most effective ways to learn trivia, so maybe there is a connection there – not so much with the legal profession but rather with jobs that require a good deal of reading, because the habit might make you faster at reading and processing that information. That’s where we’ll leave it for this week. Next week, we discuss the origins of Cheryl’s Tiger Mum persona, she reveals her training regimen for being a Chaser, and shares her Two Top Tips for anyone wanting to be a contestant on the show. Until then, then! SH: What is something that you never do when you’re writing quiz questions? AR: Social media. I have downloaded a browser plug-in that I set to yell at me if I try to open Facebook or Twitter or any of those things. You know those alerts come up, telling you so-and-so has liked your comment or some such, and before you know it, you’ve spent an hour down an unhelpful rabbit-hole of absolutely irrelevant crap. Every time I click on one of those, this browser plug in swears at me. Literally. Vile, angry language. It’s quite the motivator! SH: What’s an example of a question you’ve written that you’re really proud of? AR: Oh, so many! On Hard Quiz, it’s the ones that stump the experts. Especially if the expert is particularly smarmy and full of themselves. The first ever episode of The Chase Australia featured a question of mine that stumped even The Chaser herself! I have tried to write a ‘Fanny Chmelar’ style question for The Chase Australia, but because of the timeslot, they’ve all been rejected, which is probably for the best. Did you know that an archaic term for an open-cut mine is ‘Glory Hole?’ I wrote it as a multiple choice “In which industry do people go to work in a glory hole?” Mining, Fishing, Theatre. It’s revolting, I know, but it is an actual true fact. You can’t argue with the truth… Well, you can if you are putting out a G-rated show. SH: Are there any specific rules that you follow when you’re writing quiz questions? Follow the rules of the show! The Chase Australia has a very detailed style guide, and some very restrictive rules about length of questions and answers, which I adore. I love the language puzzle writing those entails, trying to rearrange a question to be coherent and fun in as few words as possible. The first round of Hard Quiz, where people are able to steal points, I really enjoyed writing dog-leg questions, that seemed like they were going off in one direction, but in fact were headed somewhere else entirely, trying to trick people into buzzing in early. Like one about Eurovision, where it seemed like it was going to be an obvious one about which song ABBA won with, but instead was about which venue they won at! It was the ‘British seaside resort’ of Brighton, if you’re wondering, which then of course gives (the show’s host) Tom Gleeson leeway to make a joke about ‘British seaside resort’ being an oxymoron. The fact that Hard Quiz is a comedy show as well as a game show means that all the writers have to do double time writing questions and gags. Tom writes both questions and gags himself. He’s incredibly hands on. I worked in the office at Hard Quiz, whereas I have done all my work on The Chase Australia remotely. SH: Have you ever written any questions that turned out to be controversial? And here we are, with my first interview for 2017, and I’m delighted to say it’s with The Fabulous Adam Richard! For those who don’t know, Adam Richard is one of Australia’s favourite comedians, whose successful 20 year career encompasses stand-up comedy here and internationally, radio presenting, sitcom writing, TV acting, reality TV appearances, podcasting and much more besides. You can find all the details at his website. But in addition to all of this, yet another feather in Adam’s cap is writing questions for game shows. To date, Adam has written questions for All Star Squares, (where he and I worked together) The Chase: Australia (which I’ve also written questions for) and Hard Quiz (which I haven’t – I must be slipping). SH: Over the years, how many quiz questions do you think you’d have written for TV? AR: I couldn’t even tell you how many I’ve written this week! It’s over a hundred. This week, I mean. When I started on Season 1 of The Chase Australia, I was working four or five days a week, which roughly works out to about 200 questions. Now I’m just working one or two days a week, but factoring in all the shows I’ve worked on, I’m guessing I’d be into the tens of thousands by now. SH: What’s the secret to writing a good quiz question? AR: It’s such a juggling act! 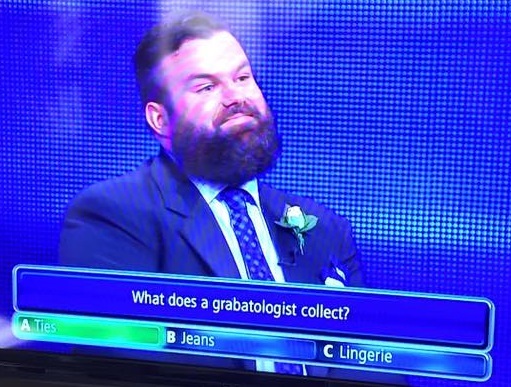 The questions on The Chase Australia, especially in the timed rounds, need to be really punchy. There are a lot of comedians writing for the show, I think mainly because the structure of a question and a joke are essentially the same – you work really hard at giving out enough information that the punchline or answer, in the case of a quiz show, is both obvious and surprising at the same time. You almost want people at home to go “Oh! Of course! I should have known they’d say that!” So, even if people are learning something from the answer, it should have its own internal logic. Also, boring is bad. Numbers and dates are boring, names are boring. I try to avoid writing answers that are a number or a name, unless it’s something that is an emotional touchstone (there’s always an exception to every rule!). I wrote a question on Hard Quiz which was “How many double A batteries go into a Nintendo Game Boy?”. That’s the kind of thing that can really fire up the happy and nostalgic part of your brain, remembering fun things from your childhood, trying to picture yourself jamming the batteries in the back of your favourite toy. SH: Are there any topics or subject areas that you return to often, when you’re writing questions?